The InBrief series provides brief summaries of scientific research on the science of early childhood development and its implications for policy and programs. Each edition of the series is available in video and PDF format. 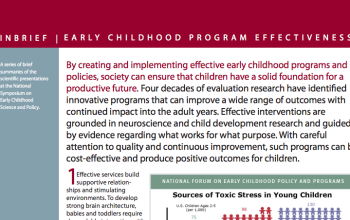 This brief explains how providing stable, responsive, nurturing relationships in the earliest years of life can prevent or even reverse the damaging effects of early life stress, with lifelong benefits for learning, behavior, and health. This brief discusses how society can ensure that children have a solid foundation for a productive future by creating and implementing effective early childhood programs and policies. This brief explains why a vital and productive society with a prosperous and sustainable future is built on a foundation of healthy child development. This brief describes why executive function skills are essential for school achievement, success in work, and healthy lives. This brief explains why the foundation for sound mental health is built early in life, as early experiences—which include children’s relationships with parents, caregivers, relatives, teachers, and peers—shape the architecture of the developing brain. This brief summarizes the science of resilience and explains why understanding it will help us design policies and programs that enable more children to reach their full potential.